Julián Carrillo was born on 28 January 1875 in the small town Ahualulco in Mexico as the nineteenth child in a poor family. He taught himself to play the violin and studied later violin, acoustics and composition with Morales at the National Conservatory in Mexico-City. In 1895 he found out using his violin that the human ear is capable of distinguishing one sixteenth fraction of a tone: "I dream of a gamut of 400 tones". He received a scholarship to study further in Europe. He studied composition with Salomon Jadassohn, violin with Hans Becker, theory with Karl Reinecke and conducting with Artur Nikish and Hans Sitt at the Royal Conservatory in Leipzig. Carrillo's first compositions clearly reveal this late-romantic background: Brahms' and Liszt's influence are clearly noticable. In 1900 he attended the International Congress of Music in Paris, where he proposed to use new note names. He won the first prize in the Ysaÿe Competition in Brussels and composed his first symphony in 1902. In 1904 he studied at the Conservatory of Ghent with Albert Zimmer. In 1905 Carrillo returned to Mexico. There he quickly became one of the most important figures in music society, especially as teacher of composition and later as director of the National Conservatory. He was also conductor and instigator of concert series. In 1911 he became elected as president of the International Congress of Music in Rome, where he was urging to reform the classical compositional forms. In 1914 Carrillo founded the Symphony Orchestra of America in New York. Around 1924 he gradually resigned from his official functions to dedicate himself completely to composing and elaboration of his octave division in 96 tiny steps, the Sonido-trece-system (the thirteenth tone). This tone system encompasses the quarter-tone and eight-tone systems; in many compositions Carrillo uses these different systems in mixed ways, where the choice of system depends on the possibilities of the musical instruments at hand. He had a special series of pianos built for his microtonal systems. The keyboards of these instruments look normal, but the sound is very different. The keyboard range of the 96-tone piano, with 97 keys, is only one octave. To notate his music Carrillo employs, besides a system with little accents being put in front of the notes, also a numerical notation by giving the tones simply a number from 1 to 96. Furthermore he founded a choir to perform microtonal music. By request of the composers guild in New York Carrillo composed the Sonata si fantasia, a 1/16-tone work, in 1926. Enthousiastic reviews in the press drew the attention of conductor Stokowski, who predicted a new musical era. In 1927 Stokowski conducted the Concertino, which Carrillo wrote at his request. In Mexico Carrillo and his students started an orchestra which was capable of playing 1/4, 1/8 and 1/16-tone music. In the mean time Carrillo became a celebrity in Mexico because of his "Sonido-trece"-revolution, and streets and squares were named after him. Also in Europe and America he received many tributes and medals, often from heads of state. In 1927 he devised a plan for fifteen different pianos: for 1/3, 1/4, etc. until 1/16-tone systems. It lasted until 1949 before the first 1/3-tone piano was built, by Buschmann in Mexico and played by Carrillo's daughter Dolores. With this instrument she also gave concerts in Paris which were a large success. In 1957 were 14 more microtonal pianos built by Sauter in Germany and in 1958 they were exhibited at the World Expo in Brussels. In the years after Carrillo's music acquired general fame. In France many compositions by Carrillo were recorded on LP in the years 1960/61 under supervision of Jean-Etienne Marie. On these recordings Carrillo conducts himself the Orchestre Lamoureux, the Chorale des Professeurs de Musique from Paris and many important French soloists. Carrillo died in Mexico-City on 9 September 1965 as a famous and honoured composer. His daughter Dolores Carillo does her best to maintain her father's work. Carrillo's music is classical in composition, clearly thematic and employs long elaborated sequences. He notated part of his compositions in a figured notation. 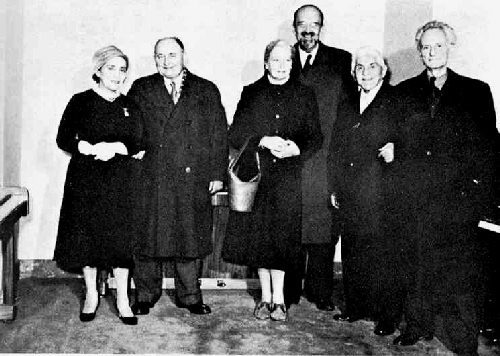 Melle Carrillo, Alois Hába, Adriaan Fokker, Julián Carrillo, Ivan Wyschnegradsky. Paris, 1958. See also the website Julián Carrillo and the Thirteenth Sound by Ernesto Solís Winkler.